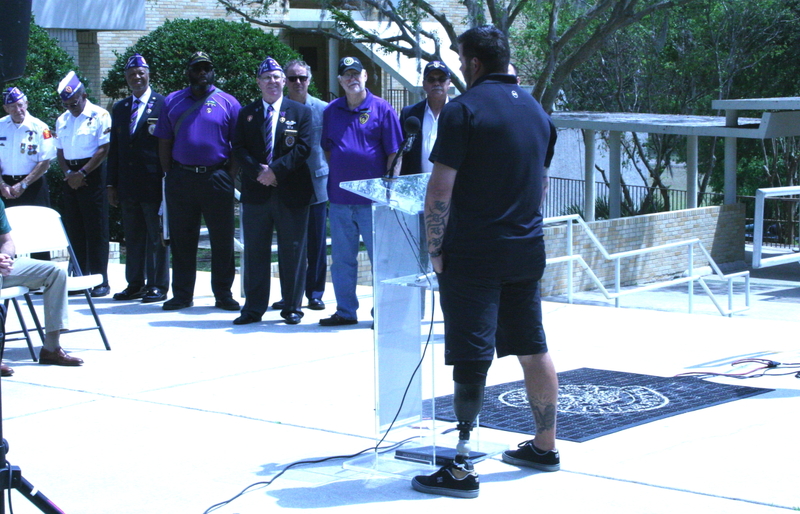 Purple Heart veteran Sean Karpf speaks at the event Monday. 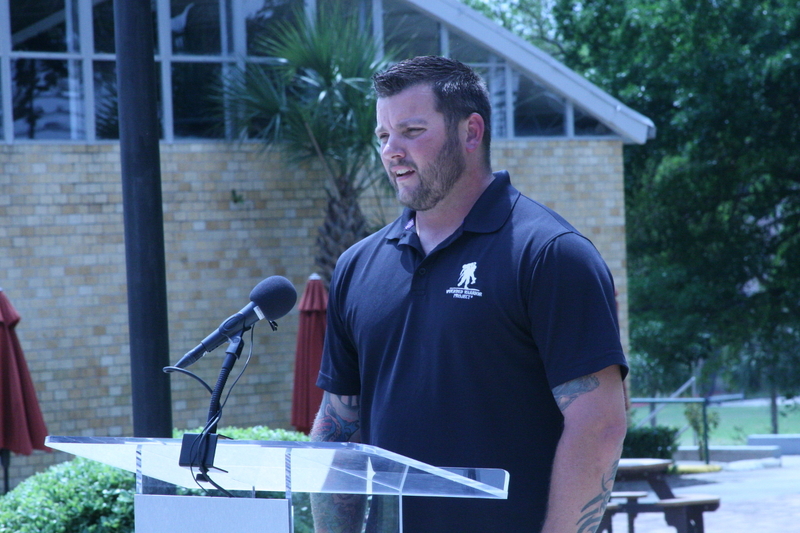 For Karpf, who lost his left leg below the knee and suffered traumatic brain injury in 2012 when he stepped on an Improvised Explosive Device (IED) during a second Afghanistan tour, acceptance and understanding is key to dealing with the onus of Post-Traumatic Stress Disorder. “My first two years transitioning after coming back, I felt lost and didn’t have a sense of purpose, but ever since I came here to JU, the other veterans have brought me in,” Karpf said at a dedication ceremony Monday, April 3, where the two Reserved for Combat Wounded signs were unveiled on campus. 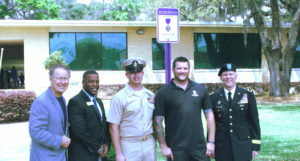 From left, JU Provost Dr. Donnie Horner; Veterans Student Coordinator Mike Mitchell; student, U.S. Navy Hospital Corpsman Chief Petty Officer and Purple Heart recipient Timothy Altizer, student; U.S. Army veteran and Purple Heart recipient Sean Karpf; and Brigadier General (ret) Mike Fleming, Senior Vice President for University Relations and Development. The University, in collaboration with the local Military Order of the Purple Heart Chapter 524, dedicated the spaces in front of Council building and the Gooding building to honor its heroes and remember their achievements, courage and dedication, said Brigadier General (ret) Mike Fleming, Senior Vice President for University Relations and Development. 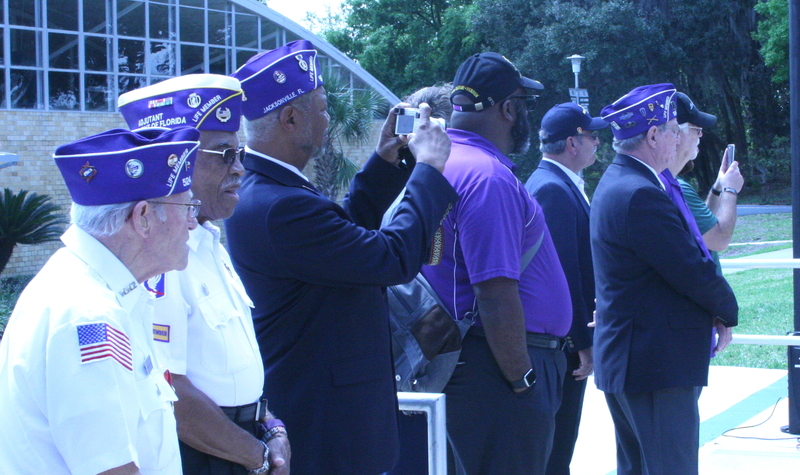 He noted that JU has a military community almost 600-strong, including its Naval ROTC program, student veterans, military dependents and military-affiliated faculty and staff. With its Center for Community Engagement that spearheaded creation of the Northeast Florida Military Veteran College Network, a comprehensive Veterans and Military Resource Center, leading-edge Veterans Career Track-Military Veterans program, the Defender’s Den study lounge in the center of campus, a 100 percent Yellow Ribbon match and much more, JU was recently selected among the top schools on the Military Times “Best for Vets Colleges 2017” list, the most prestigious of such designations. 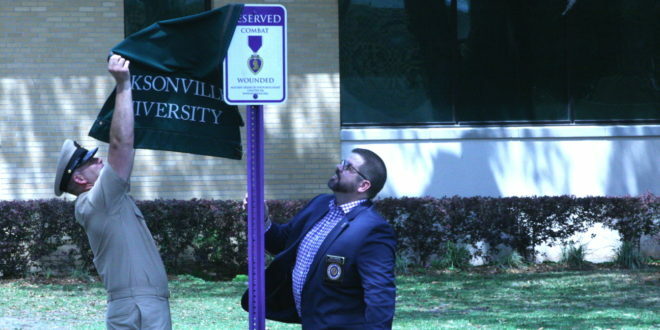 Chris Vedvick, adjutant for the Military Order of the Purple Heart Chapter 524, thanked JU for taking the initiative on the dedicated parking spaces.